After you take a screenshot of an iPhone or iPad in iOS 11 or later, a little thumbnail preview of the screenshot appears in the bottom left corner. Tapping on that screenshot preview opens Markup where you can draw on the screenshot or quickly share it, but if you’re not going to markup your screenshot then you might prefer the screenshot preview to not be on the screen any longer. 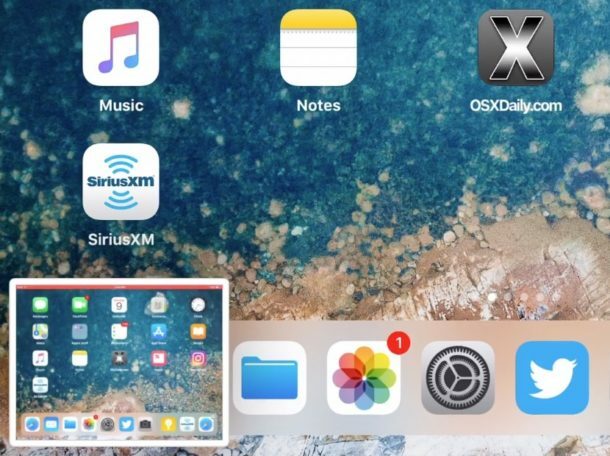 Currently there is no way to disable the screen shot previews in iOS, but you can easily dismiss the screenshot thumbnail previews and push them off the screen of an iPad or iPhone. You can repeat this as many times as you need to dismiss the screenshot previews. The animated GIF below demonstrates this in action, swiping away to the left on the screenshot thumbnail to dismiss the preview. Remember, if you tap on the screenshot preview it will open into markup instead of dismissing. To hide the screenshot preview you have to swipe it away off the left of the screen. 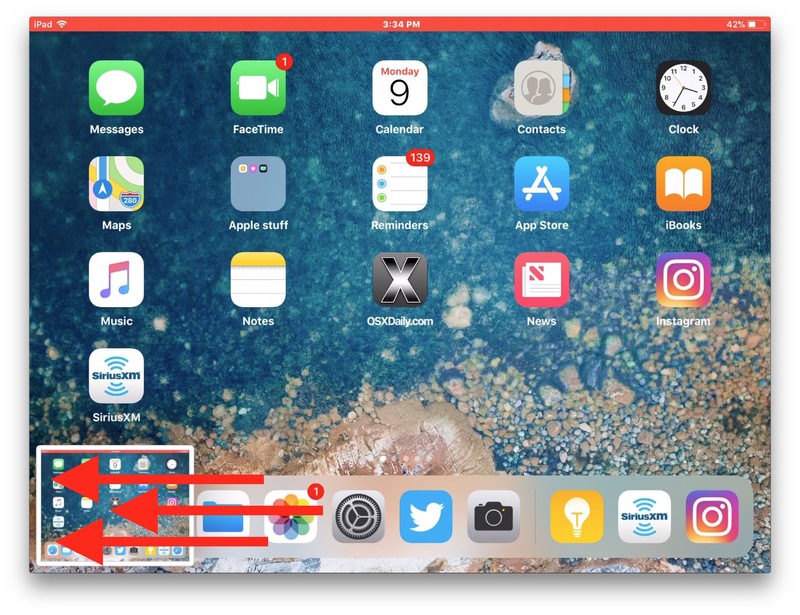 You’ll find that if you take many repeated screenshots in iOS 12 or iOS 11 or newer, then a stack of thumbnails will appear in the lower left corner. You can dismiss the entire stack of screenshot previews with a swipe left as well. For now this is the only method to hide the screenshot previews in iOS 11 and newer that show up in the corner of the iPhone or iPad display, but perhaps a future release of iOS will offer a settings toggle to adjust this feature or disable the screenshot thumbnail preview entirely. For accuracy, in your instruction item “2” don’t ‘tap and swipe’, just swipe. If you tap first it will go straight to mark-up. They also forgot to note that swiping to the left dismisses the thumbnail(s) and prevents the markup editor from displaying, but it does not delete the actual screenshots, which will still be saved to the camera roll in the photos app. That means undesired screenshots must be deleted from there later. Also, it’s not absolutely necessary to swipe left to dismiss the thumbnail preview. If no action is taken, it will still automatically slide towards the left and disappear after a few seconds. The latter action (screensnap disappearing after a few seconds) stopped working for me the other day. Now the only way I can get rid of the lingering thumbnail is to swipe. Haven’t found a setting that I can reset to the auto-disappear option. This “feature” is simply the most egregious kind of bloat. When will companies simply fix things that are broken and only add things that people overwhelmingly want? Apple used to be very pragmatic about this kind of thing, which comes down to a violation of the user’s relationship with their personal technology. Microsoft used to be the company that stuffed our lives with bloatware. They (Microsoft) actually seem to have become more sensitive to this over the past few years. Bad, Bad on Apple for putting these inane tinkerings with iOS into their uneditable default settings! Counterpoint: This feature is awesome. I take loads of screenshots and now I can send them to Messages/Slack/Airdrop to Mac (oftentimes with cropping) and then not save them, avoiding the hassle of going through my Photos library later to delete these built-up transient shots. Same with me. I don’t take screenshots as often as you do, but when I do it’s preferable to have the markup editor available right away than to save the screenshots and then reopen from the photos app to mark up or crop. Plus, from the markup editor we also have the ability to delete unwanted or accidental screenshots right there as opposed to opening the photos app and looking for the picture to delete it. It’s worth noting that when you click the home and sleep buttons, the unedited screenshot is still immediately saved in the photos app just as in previous ios versions. If you dismiss the thumbnail as described in the article, the actual image will remain in your camera roll until you choose to delete it. If you do open the markup editor, you have to share the screenshot via messages, airdrop, etc, to avoid saving the picture. Otherwise, the original screenshot (without any markups you may have added later, that is) will just go to the ‘recently deleted’ folder in the photos app when you tap on ‘done’ and ‘delete screenshot’ in the markup editor. And you will still have to open your photos app and delete it from there (or wait 30 days) to completely remove it from your devices. Do note that even if you choose not to save the cropped or otherwise edited versions of your screenshots after you shared them via messages, airdrop, etc, their original unedited versions are still going to be stored on your device in the ‘recently deleted’ folder within the photos app. And they will remain there for 30 days unless you manually delete them sooner. I understand some people want the feature, but many do not. So why not make it optional? It’s the inability to get rid of it that makes so many, like myself, extremely frustrated. Thanks for the tip.This is a good example of those small details that Apple never bother to share. Or just do nothing and it disappears in a couple of seconds. Right. Do note that, either way, this does not mean the actual screenshot is discarded. It will still be stored in Camera roll in the photos app. Or change from Portrait/Landscape to the other orientation and it also disappears. By the way, is there any way to do this? The way it was in iOS 10…. I take screenshots from tutorial videos but the new thumbnail hides video pause button. By the time I swipe it off it is too late to pause the video. I bought iPhone instead of Samsung just to be able to make screenshots from videos efficiently. Now the new thumbnail makes iPhone less efficient. Hope they will fix it and users will be able to either disable the thumbnail or make it appear in a diffrent corner – not over video pause button!!! I absolutely hate that preview icon as well as it makes it hard to do multiple screen shots quickly. But as an alternative to screen shots, you can now just use the screen recorder and record a video of your entire tutorial. Then, transfer that mp4 to your PC and grab your screen shots directly from that. The video resolution matches your iphone screen size so it should be accurate. I can’t stand the markup. It waist my time. It can’t be disabled, what a headache. This is the worst feature I’ve ever seen in an IOS update. For those that like it, fantastic! For those that don’t, give us a chance to untoggle it! I think this feature is one of the best features ever because I like to crop my screenshot straight away ! Hey, I Gabe an iPhone 6S running the latest iOS 11 but now when I take screenshots there’s no thumbnail on the left bottom corner, no markup chance all. How do I fix this please? While it can’t be disabled mine has disappeared, the shots as usual just go straight to photos. How do I get the markup back? I’m an interface designer and this drives me nuts, always clicking on it by accident. They definitely need to implement and off feature stat. I love the new feature. However, I’ve HAVE disabled it somehow and am trying to fugure out how to get it back! I’ve tried swiping the opposite direction to see if it would appear, but nothing. This could be the answer to all of our issues if someone knows the answer to this. I may have swiped it off accidentally, and it never showed up again. Try rebooting your iPhone, it is not possible to disable the feature currently so you likely found a bug that is preventing the screenshot thumbnail from showing up. Mine is gone. When I hit the buttons nothing happens but the screenshot shows up in my pics. No flash of white or sound. This is by far T H E most annoying and stupid thing Apple let in my hands for a decade. People could say fanboy and what not. Is and was made for the lucky ones in the medla and entertainment businnes. But now we maybe start to see what a huge loss Steve Jobs death was. This crazy screenshot thing and the fact that during the 3,5 years I had my MacBook Pro. All they at Apple could deliver was a small plastic banner/screen and 400hz CPU. And still. 4 years later. Not even 32 GB ram. Trust me. Or make me sorry of this comment. Steve Jobs would N E V E R had accept such a counter productive thing. Maybe I could have comment this in another mood. People stat away from Apple! And made sense as a pro user. I just lost the screenshot thumbnail on the bottom left screen of my iphone 8+. My phone has also stopped guving the “flash” that indicates a successful screenshot was taken. Now the only way to check & view a screenshot was taken is to view fr camera roll, or trun on my camera click sound. How do i restore my previous settings? What’s the point in this article if you say, “Currently there is no way to disable the screen shot previews in iOS”? This feature is SOOOOO ANNOYING! And no, you cannot simply get rid of it. It pops up on the screen and I’ve swiped endlessly and it just sits there. I wish Apple oils do away with this pointless and not needed feature.